Athanasius was born in Alexandria in the year 296 A.D. and from his early childhood had an inclination to the spiritual life. He was a deacon to Archbishop Alexander and accompanied him to the First Ecumenical Council [Nicaea, 325 A.D.]. It was at this Council that Athanasius became renowned for his learning, devotion to and zeal for Orthodoxy. He contributed greatly to destroy the heresy of Arius and to strengthen Orthodoxy. He wrote the Symbol of Faith [The Creed] which was adopted at the Council. Following the death of Alexander, Athanasius was elected Archbishop of Alexandria. In his calling as Archbishop of Alexandria, he remained for forty years, although not for the entire time on the archepiscopal throne of the archbishopric. With few exceptions, throughout his life he was persecuted by heretics. Of the emperors, he was persecuted mostly by Constantius, Julian and Valens; of the bishops, by Eusebius of Nicomedia and many others; and by the heretic Arius and his followers. Athanasius was forced to hide from his persecutors, even in a well, in a grave, in private homes and in the deserts. Twice he was forced to flee to Rome. Only before his death, did he live peacefully for a while as the good shepherd among his good flock who truly loved him. Few are the saints who were so mercilessly slandered and so criminally persecuted as St. Athanasius. His great soul patiently endured all for the love of Christ and, in the end, emerged victorious from this entire, terrible and long-lasting struggle. For counsel, for comfort and for moral support, Athanasius often visited St. Anthony, whom he respected as his spiritual father. For a man who formulated the greatest truth, Athanasius had much to suffer for that truth until in the year 373 A.D., the Lord gave him repose in His kingdom as His faithful servant. To the question: "Why did the Son of God appear on earth in a human body and not in another form of creation? ", the brilliant St. Athanasius replied in this manner: "If they ask why did He not appear in some other better form of creation, for example: as the sun or the moon, or the stars or fire, or the wind but just as a man? Let them know that the Lord did not come to show Himself but to heal and teach sufferers. For, to reveal Himself only to amaze the viewers would mean to come for a show. It was necessary for the Healer and the Teacher, not only to come, but to serve for the benefit of the suffering ones and to reveal Himself as such so that this revelation would be bearable for the sufferers. Not one single creature was in error in the eyes of God, except man alone: neither the sun, nor the moon, nor the sky, nor the stars, nor water, nor wind did betray their ranks but, on the contrary, knowing their Creator and their King - The Word [The Logos], they all remained as they were created; only human beings separated themselves from good and replaced truth with deceit, and the honor belonging to God, as well as the knowledge about Him, they transferred to devils and to men carved out of stone [idols]. What is, therefore, so unbelievable in this, that the Logos [The Word - The Son Of God] appeared as a man to save mankind?" Indeed, even as we ask the unbelievers of our day: In what form would you wish God to appear, if not as a man? 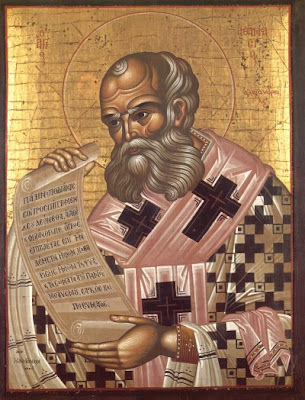 The entire pastoral ministry of the great Athanasius lasted 46 years, 16 of which were spent in exile. His spiritual fame and radiance made him the spokesman of orthodoxy par excellence. His fearless battles against heresy resulted in the identification of Christianity with Athanasian orthodoxy, which was centered on the Lord and Savior Jesus Christ as the Inhominated Son and Word of God. This is exactly what shines through the pages of his inestimable writings and is sealed by his last prayer, which has been preserved in an ancient Coptic text. According to this text, which is based on the personal witness of his Archdeacon, who stood by him at the moment of his departure from the present life, and was uttered shortly before he delivered his sanctified soul to the angels who came down to receive it, recalls the entire course of the divine economy for the salvation of mankind and concludes with a doxology to the Lord Jesus Christ. Thou art Jesus, the Son of the Father, Yea, Amen. Thou art He who commandeth the Cherubim and the Seraphim, Yea, Amen. Thou has existed with the Father in truth always, Yea, Amen. Thou rulest the Angels, Yea, Amen. Thou art the power of the heavens, Yea, Amen. Thou art the crown of the Martyrs, Yea, Amen. Thou art the deep counsel of the Saints, Yea, Amen. Thou art He in whom the deep counsel of the Father is hidden, Yea, Amen. Thou art the mouth of the Prophets, Yea, Amen. Thou art the tongue of the Angels, Yea, Amen. Thou art Jesus my life, Yea, Amen. Thou art Jesus the object of the boast of the world, Yea, Amen. Athanasius as the defender of orthodoxy was characterized as one who fought against the whole world (contra munum), because he fought through suffering the darkness of the world with the light of Christ. His suffering continued the redemptive work of Christ. The Church honors his memory on May 2 (day of his falling asleep) and on January 18, along with his great successor St. Cyril of Alexandria (day of commemorating their triumph). Source: Saint Athanasius of Alexandria: Original Research and New Perspectives, pp. 92 and 204.